“The Optimistic Decade is a stunning and unusual debut. Heather Abel's subjects are political idealism, American-style lust for land, and the perils and pleasures of young love. Her voice is warm, beautifully funny, and completely original. Although the novel spans decades and tackles big themes, its intimate moments and vivid creation of an unforgettable landscape are what continue to haunt me. Once you enter the world of this book, you—like the characters—will find it hard to leave." "The Optimistic Decade is a stunning and unusual debut. Heather Abel's subjects are political idealism, American-style lust for land, and the perils and pleasures of young love. Her voice is warm, beautifully funny, and completely original. Although the novel spans decades and tackles big themes, its intimate moments and vivid creation of an unforgettable landscape are what continue to haunt me. Once you enter the world of this book, you--like the characters--will find it hard to leave." "A sharply funny novel about a Utopian summer camp presided over by charismatic leader Caleb Silver, who’s on a mission to teach others to live simply." "A coming-of-age story set in the age of Reagan and Bush, Heather Abel’s wonderful novel asks a question that’s more relevant now than ever: Amid the maddening news of the world, how do you go about living an authentic life? Perceptive, funny, and utterly original, The Optimistic Decade is a book for anyone who’s navigated the twin crises of idealism and youth." "What does it mean to measure our goodness against wide-open spaces? 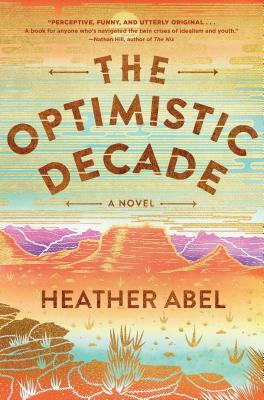 In Heather Abel’s sharp, beautiful debut, American idealism and the obsession with land meet up on a single plateau in the Rockies, leading to a summer of stunning consequences. Long after The Optimistic Decade has ended, readers will linger with these pages, haunted by Abel's ability to bring both the spectacular and the intimate to life." "In a comic debut, the lives of five characters come undone at a remote Colorado summer camp . . . Abel is excellent at class resentment and its signifiers . . . [she] writes in larking, pleasurable sentences, letting each protagonist...wrestle with loneliness and horniness and purpose . . . A playful look at Jewish coming-of-age and coming-to-terms in the American West."